The tram line opened in July 2004. 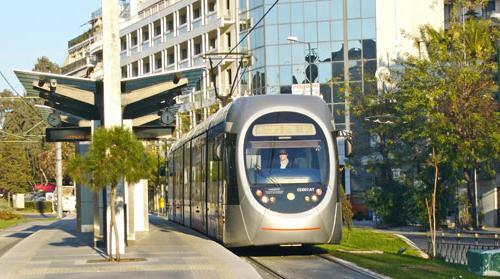 Trams run from Syntagma square through to Voula. This is a beautiful coastal route in which you get to experience Athens gorgeous scenery. The trams give the opportunity of seeing neighbourhoods that not many people see, and to enjoy off beat restaurants, cafes and bars. Neighbourhoods like Neos kosmos and Nea Smyni give the impression of remnants of the refugee settlements of the twenties. It also gives you the chance to stop at beautiful beaches or the yacht marina at Alimos. The tram cars are high tech, air conditioned and extremely comfortable, if not a little slow but this does allow for a relaxing ride to enjoy such beautiful surroundings. Trams run frequently, between 6am – 1am, every 8 minutes, between 1am – 6am trams run every 40 minutes.The average speed for trams is 25km and the maximum speed is 75km. The track consists of 48 stops and is approximately 27km long.